Hey New YS640 owner here. 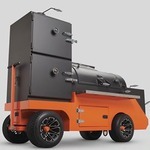 Got Orange Comp Cart, with all the goodies including the grill grate and 2 piece defuser. Been Smoking on Pellet grills for 15 or So years. After burn in yesterday I threw 6 butts and 2 briskets on to see how it handled it. Apparently I'll need to dial a few things in but not a bad first run.